A pretty funny movie told from a child’s point of view, about his family and his wish for a certain present during Christmastime. A witty movie about a family during the Christmas season and the little boy who has his heart set on one present that he is unlikely to get. This film is about the child’s perspective and features his voice over to show the mentality of a kid thinking he can manipulate and be manipulated by grown ups. Each character in the family becomes very funny in his or her own way. The father has the great lamp storyline. 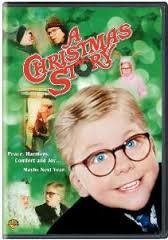 The mother, the wonderful situation where Ralphie says a bad word, and the mother must call up a neighbor about it. Each of these short stories (which are not labeled as such, but end up being the building blocks of the overall film,) are incredibly humorous. The films is all about the characters’ reactions to the madness going on around them, and Ralphie’s reactions to these kinds of things (including the police and fire department showing up when a kid gets his tongue stuck to a pole,) are priceless. A Christmas Story is a pretty wonderful movie. This is the film that works on multiple levels for both adults and kids. It’s a story that’s told from the point of a young boy (Ralphie, played by Peter Billingsley,) who wants a specific toy for his Christmas present this year, and plans different ways to manipulate his parents into getting it for him. That’s the premise at the start of the film, anyway. As the movie goes on, it becomes more about the family and different short stories that happen to them. At the start of the film, we hear Ralphie’s voice-over, (voiced by an adult, which makes the way he is talking like a kid, all the funnier,) and he explains that it is now every kid’s favorite time of the year. We go into the town and watch Ralphie by a toy store window, looking at all of the different toys on display. He zeroes in on the toy of his dreams, the Red Rider Air Rifle Beebe Gun. There’s a cardboard cutout of the Red Rider with a message coming out of his mouth, and Ralphie starts reading it out loud as we watch his lips move behind the glass window. From here, we start getting into Ralphie’s plans to persuade his parents. First, he takes an advertisement for the beebe gun and puts it in the middle of his mother’s magazine. What makes this great is the voice-over explanation of how Ralphie thinks his mother will now have no choice but to read the advertisement. Of course, we know that the mother would probably just throw the ad out, or maybe not even notice it at all, but to a kid, this plan is ingenious. The same can be said for Ralphie’s comment at the breakfast table that morning, that some people saw a bear outside of the local candy store. His voice-over explains that he was looking for a comment that was not too obvious or extreme, but also just enough to give his parents a hint on what they should get him. After seeing the response by his father, Ralphie instantly regrets this decision. At school, we get our first of these “short stories,” when one boy dares another one to lick a frozen pole. It all starts on their way to school, when one of the boys says that his father told him if you touch your tongue to the pole, than your tongue will get stuck to it. The other boy doesn’t believe it, and so the challenge begins. During recess time, the boys stand around a frozen pole and continue to egg each other on. 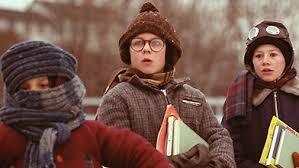 Ralphie’s voice-over explains the different levels of the dares and how the “triple dog dare,” is the biggest one. Once that dare comes out, there is no turning it down. This story ends with some classic moments where Ralphie sits there, in the classroom, head in his hands, as kids run to the window announcing how bad things are getting for the boy who is stuck to the pole. First the fire department shows up. Then the police. Ralphie’s reactions, of not believing how much worse it keeps getting, are priceless. Another great story here involves the father receiving a prize for all of the magazine quizzes he completes and then sends in. The prize is a lamp of a leg. It arrives in a huge box and the father is incredibly excited. When he takes it out, he is thrilled by everything about it. Even before he realizes it is a lamp, when he thinks it is just a statue of a leg, the father is overjoyed. It’s not so much the content of the prize, but the fact that he won anything and that it marks his accomplishment, which makes him so proud. He puts the lamp front and center in the living room window and then walks out to the street to get a look at it and tell his wife how far to move it over. Once in the street, tons of neighbors come out of their houses to see what this man is up to. He explains that it’s a major award, and then the neighbors start talking and telling each other. All the while, the wife stands next to the lamp with her face in her hands, totally embarrassed. She thinks the lamp is ugly as hell. Her reaction to this is not unlike Ralphie’s reaction to the police and firemen coming for the boy with the frozen tongue. Both scenes are hilarious. Other short stories here involve Ralphie getting into trouble for certain things. There’s that frozen tongue situation where his teacher told the students to speak up if they were involved, and that whoever was responsible was probably feeling very guilty and would feel better if they confessed. To that, Ralphie’s voice-over said that adults were always saying things like this, but kids knew better. And then there’s the story of Ralphie cursing, while changing a tire with his father, when he drops all of the nuts and bolts that he was holding. Ralphie’s punishment is to have a bar of soap in his mouth. The funny part of this scene comes when his mom demands a name from him, of the boy he heard this language from, and Ralphie just says the first name that comes to his head. Now the mother calls up the mother of this boy, Ralphie mentioned, and we get to hear that boy’s mother’s hilarious reaction. It includes her screaming at her son and then going to town on the boy, and Ralphie having to listen to the entire thing. Once again, it’s all about the reaction. While most of the scenes do work, there are some that are less funny or interesting than others. For example, Ralphie keeps having daydreaming fantasies about things, and most of them are pretty silly. These a quick scenes and they are always surrounded by a white cloud-like border to reveal that they are dreams or fantasies. One of them shows the family being held hostage by a bunch of burglars and Ralphie coming out with his air rifle and blowing them all away. Another one shows his teacher reading his “theme” writing assignment and being so enthralled by it that she starts celebrating. Perhaps the funniest of these shows Ralphie blind, coming to see his parents (still looking like a little kid,) and telling them that he went blind from soap poisoning. There’s a subplot or short story about a local bully named Scott Fargas and his toadie or sidekick. The toadie wears a old man’s cap, and looks like a street tough complete with finger gloves. The two of these kids terrorize Ralphie and his friends. They mostly do this by screaming roars at the boys who then go running away. When Ralphie receives a bad grade on the theme that he thought he had done such a great job on, he is miserable. Then he runs into the bullies who throw a snowball at his face. And to top it all off, Fargas now makes fun of Ralphie for starting to cry. That becomes the final straw as Ralphie charges Fargas and proceeds to beat the bully up, holding nothing back. The story about the air rifle comes back around in time for the ending with Ralphie realizing that things are not looking so good for him, and that he needs to turn to a last resort. Santa Claus. There’s a Santa having kids come up and sit on his lap at the local mall, and Ralphie figures if he can get there, and ask Santa for this gift, it just might come true. That turns into a whole big fiasco. First there’s the parade that Ralphie’s parents make him go to, causing him to think the store might be closing and he will miss his chance to speak to Santa. Then there’s the line for Santa, complete with the strangest kid imaginable standing next to Ralphie and talking to him. And finally, there’s Santa himself, who either looks drunk or like a total psycho, screaming “Ho,Ho,Ho,” and not wanting anything to do with the kids who are brought to him. He terrorizes every one of them, sending them off screaming. Ralphie has a great interaction with this Santa, where at first he forgets what he wants, starts going down the slide, then turns around, climbs back up, and tries to tell Santa his wish. All of this leads to Christmas morning with Ralphie having to try on the pink bunny suit his Aunt got him and his father’s hilarious comments about it. “He looks like a deranged Easter bunny. He looks like a pink nightmare.” And then, of course, there’s the opening of presents and the climax. It’s a fun ending to a great comedy. This movie is funny on so many levels. There’s the kid’s point of view, and then the adult point of view about the kid’s point of view and how ridiculous it is. And both are very funny. Ralphie has a bunch of great little stories that he finds himself mixed up in, and his voice-over takes us through each one of them, showing us his perspective on the craziness happening all around him. It turns out to be the perfect formula for a very cute and enjoyable holiday film.